Here's one down-home country dinner every dog is gonna love. 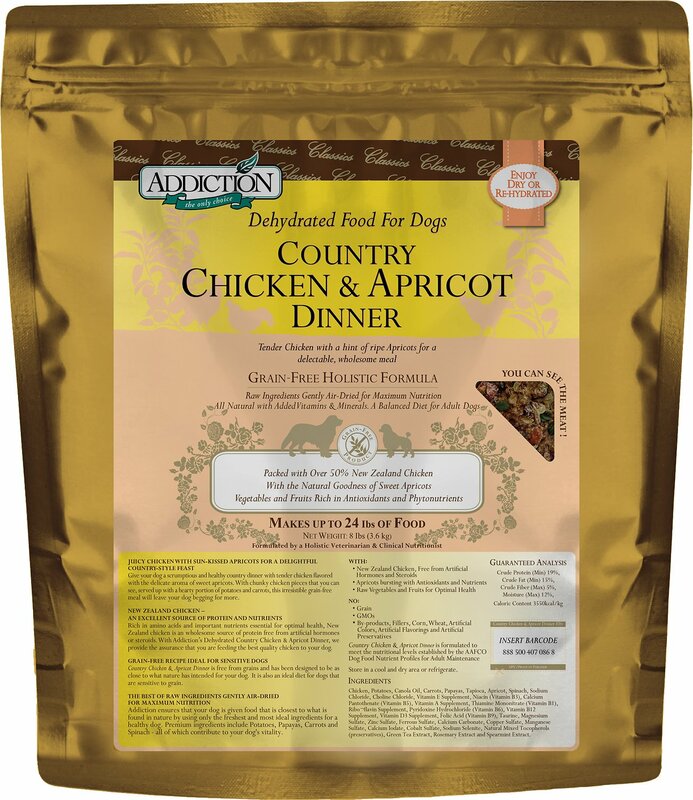 Grain-Free Country Chicken & Apricot Dinner Raw Dehydrated Dog Food from Addiction is a homestyle feast filled with chunky bites of chicken, carrots, spinach, and apricots. Since the fruits and veggies are raw, they still have all of their nutritional value to give your pet pal the biggest boost of health in every single bite. 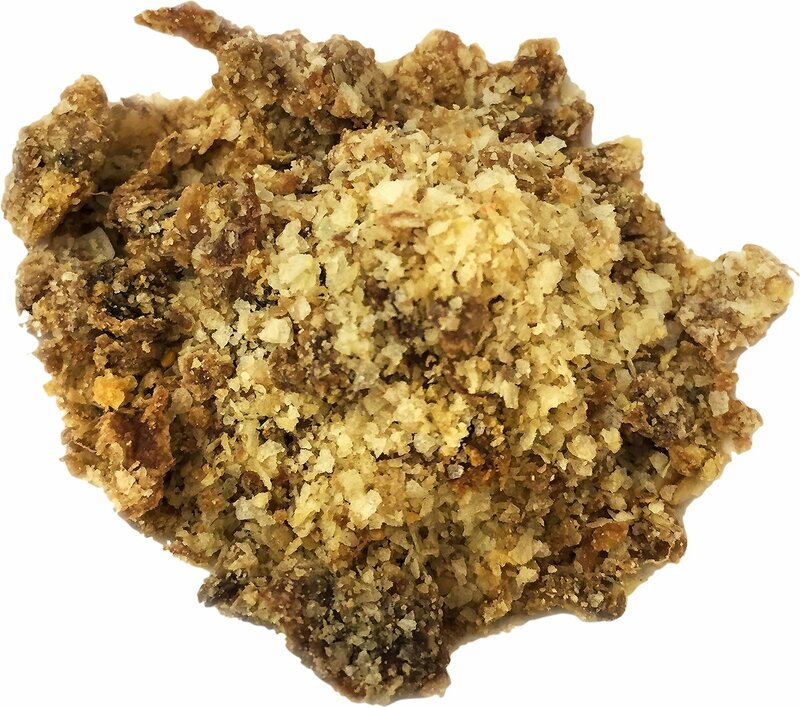 Grain-free diets are great for dogs suffering from tummy troubles or food-related allergies. 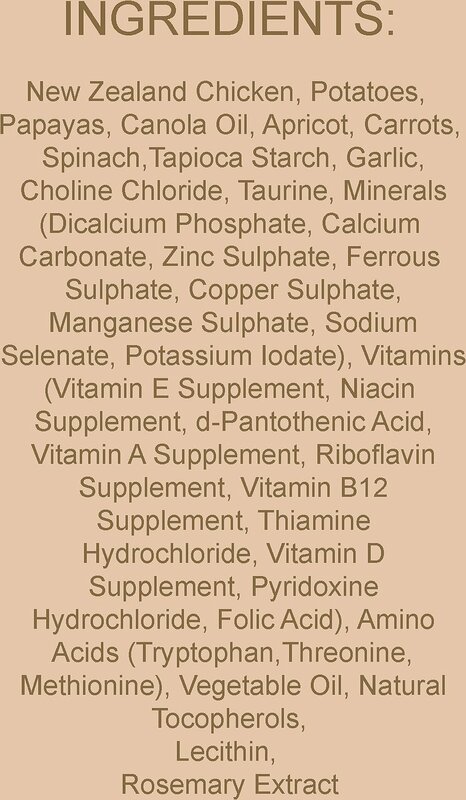 Chicken, Potatoes, Papayas, Canola Oil, Apricot, Carrots, Spinach, Tapioca, Choline Chloride, Taurine, Dicalcium Phosphate, Calcium Carbonate, Zinc Sulphate, Ferrous Sulphate, Copper Sulphate, Manganese Sulphate, Sodium Selenate, Potassium Iodate, Vitamin E Supplement, Niacin Supplement, D-Pantothenic Acid, Vitamin A Supplement, Riboflavin Supplement, Vitamin B12 Supplement, Thiamine Hydrochloride, Vitamin D3 Supplement, Pyridoxine Hydrochloride, Folic Acid, L-Tryptophan, L-Threonine, Dl-Methionine, Tocopherols (Preservatives), Lecithin, Rosemary Extract. I make my dog’s food and this makes it too easy. All I do is add fillers. My Pit mix, Isadora loves this food. I add it to her home-cooked meal and she licks the dish clean every time. Her rating... two paws up. 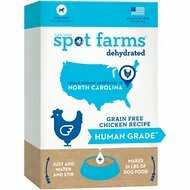 My dogs love this food, but the last time I ordered it, the expiration date was 1 week after I received it. Unfortunately, I decided to order several months of the food at one time. I sent back what I could but am stuck using an expired box. My dogs have been eating dehydrated for a year. They typically like the warm sloppy mess over their more traditional kibble. I started with dehydrated because of my rescued American Eskimo’s sometimes sensitive stomach. The other guy got it too because I can’t play favorites. They tried this for the first time and when finished kept looking and crying for more. I was surprised. This was super gentle on my Eskie’s Stomach too. Highly recommend. All my dogs love this food. 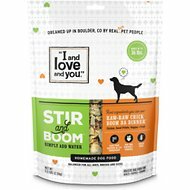 I like it because it is grain free and if I have to travel with my dogs I don't have to worry about storage or spoiling. Since it is dehydrated I can put it into a container and feed only what is necessary. There is no waste. Healthy, easy to use, they love it. Can be used as a topping over dry. My dogs love this! I use it as a topper to their dry kibble. I love it, because it so easy to use. You can mix up a little or a lot and keep it in the refrigerator, which is what I do. I usually mix up a 3 day supply. 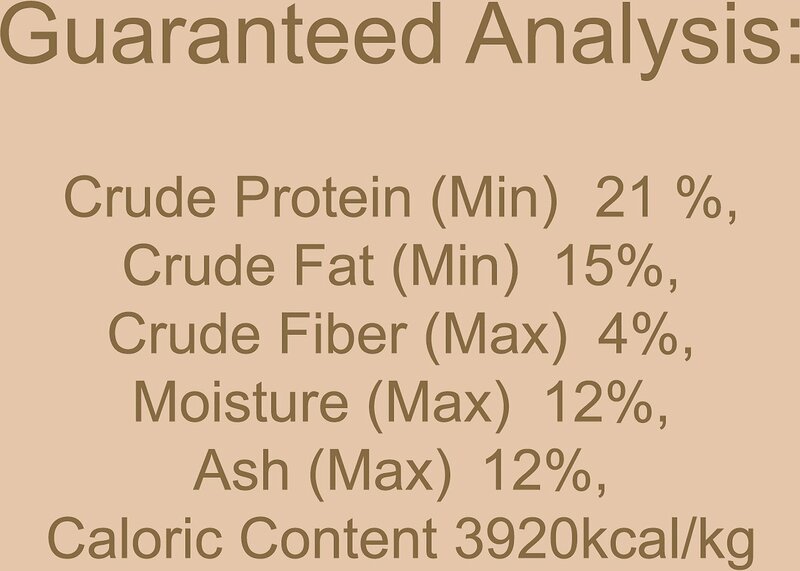 I also like the variety, and the uncommon protein sources. My 12-YO Corgi suddenly became picky about dog food. 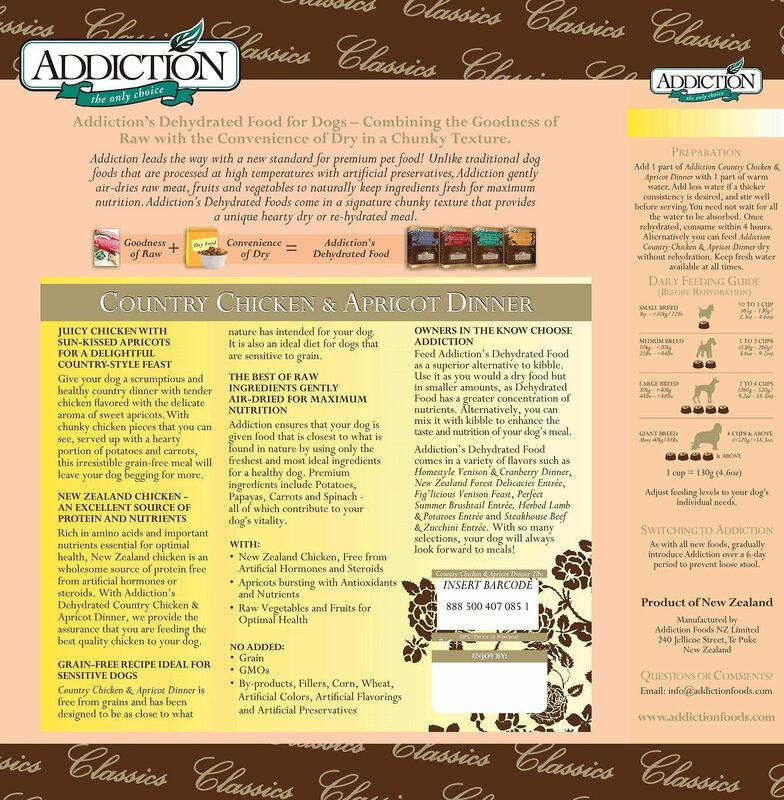 Did some research and tried the Addiction Chicken & Apricot, and she's picky no more! She loves this food, and I must admit it smells pretty good! Since she is eating well again, she's frapping like a puppy again too. She does a little play bow, and off she goes, zooming around the house like she did years ago! Thank you!!! Happy meal times at my house now thanks to Addiction Raw Dehydrated Dog Food. 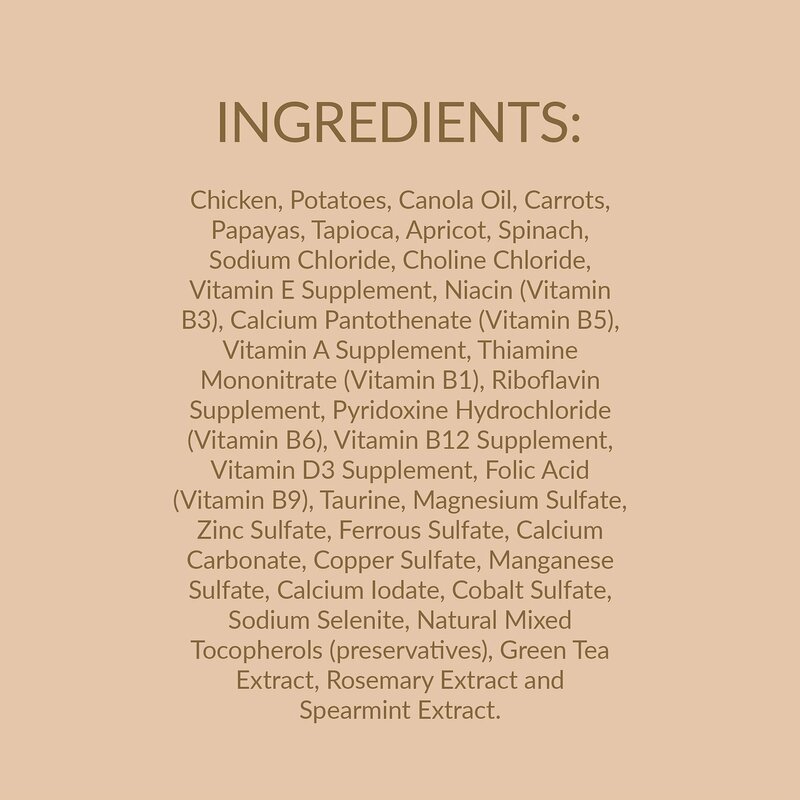 It's a nutritious food I know is good for my dogs. They love it. It's so easy to prepare so I love it too. I would recommend it highly. Only food I ever bought, and I've bought many, that the dog doesn't move til he's done.